When it comes to the best gaming laptops, Razer sits in a pretty comfortable place. While its Razer Blade laptops are a bit more expensive than its competitors, Razer absolutely excels in key areas: longevity and build quality. Editor's Note: The 2018 Razer blade is finally here, and we’ve given it our full review right here. The last several 14-inch Razer Blade notebooks have constantly improved on battery life, and the 2017 Razer Blade is no different. When you then consider the gorgeous chassis design that none of Razer’s competitors have been able to touch, the admittedly high price of entry seems less egregious. 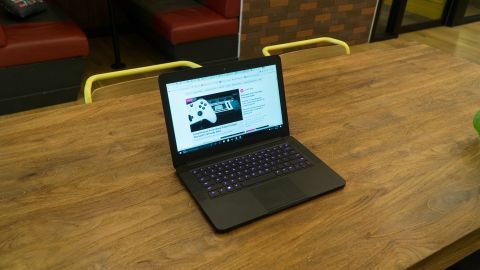 While it may not be as powerful as the new Razer Blade 2018, the 2017 version is still a Windows 10 powered gaming laptop, equipped with a 7th-generation Kaby Lake CPU and a 4K touch screen. It might not be the top of the line anymore, but it’s still definitely worth considering. The 2017 Razer Blade still starts at $1,699 (£1,659, AU$2,549) for a non-touch Full-HD screen and a 256GB SSD. However, this configuration doesn’t seem to be available on the Razer store anymore, doubtless to make room for the 2018 Blade. Don’t worry though, it’s still available for that price on Amazon. To have Razer’s latest primary gaming laptop in glorious Ultra HD (UHD), you’ll have to pay up at least $2,099 (£2,089, about AU$3,099). That buys you 512GB of solid-state storage, one of the latest, highest-end mobile CPUs from Intel, 16GB of memory and the same Nvidia GeForce GTX 1060 graphics chip as before behind a super-sharp, 14-inch touch display. The only available upgrades to this 4K model is a 1TB solid-state drive (SSD) for a cool $2,499 (£2,489, AU$3,699) total. Once this beast is ready to ship, it shall decimate many a savings account. Fortunately, the new 4K Blade is now available worldwide, along with some nice price drops. By comparison, an Alienware 13 with an OLED touchscreen, though only QHD (2,560 x 1,440), and with double the RAM and SSD storage, meets the priciest Blade in all other regards for $2,449 (about £2,209, AU$3,917) as of this writing. If you’re looking for a deal, we have you covered. Right now you can pick up a refurbished Razer Blade on eBay in the US for $1,389 (about £1,048, AU$1,872). That will get you the Full-HD version with a 512GB SSD. Frankly, absolutely nothing about the Razer Blade design has changed now that it’s packing an optional Ultra HD display and newer processor. That’s not necessarily a bad thing, but it would be cool to see Razer go a little Apple with features unique to only its laptops – especially if they’re going to continue to consistently cost more than similarly-specced competitors. We’re already seeing this in the Razer Blade Pro’s side-car oriented trackpad and original mechanical laptop key switches. Now, let’s get those fun niceties into the more mainstream models. All in all, this is the same thin and light, lithe-feeling gaming notebook that, by all appearances, shouldn’t be able to play all the games it can. That said, the 4K touchscreen version does come in noticeably heavier at 4.3 pounds (1.95kg) compared to the 4.16-pound (1.88kg) FHD version, thanks in large part to heavier touch display components. Speaking of which, we find the display quality to be unchanged, which is a good thing. It represents colors accurately and is plenty bright even at low levels. Plus, a matte finish on the FHD version helps tremendously with glare – you don't get that from the 4K touch model. Regardless, you’re paying for the sweetest-looking gaming laptop around here, and in that department the Blade continues to deliver, easily outclassing the Alienware 13 and Gigabyte in terms of design and aesthetics.